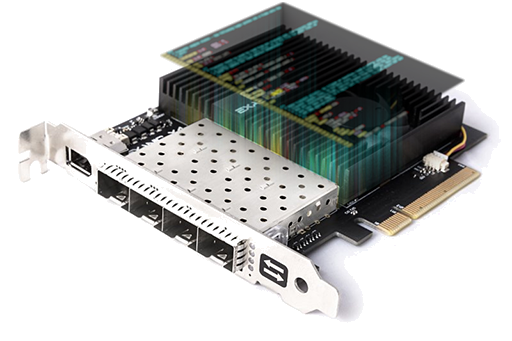 The Exablaze FPGA firmware development kit (FDK) opens up the FPGA fabric inside the ExaNIC X10, X40 and V5P network cards and ExaLINK Fusion application platform. It allows customers to take advantage of Exablaze's ultra-low latency 10GbE, 1GbE MAC and DMA IP. By offloading latency critical parts of an application onto the FPGA, customers can eliminate the PCIe bus overhead and achieve true bump-in-the-wire latencies. The FPGA development kit comes with source for an example application that demonstrates ultra-fast TCP responses to inbound packets, useful in high-frequency trading. Other use cases include deep packet inspection, advanced packet filtering and full line rate packet processing. The ExaNIC FPGA development kit is fully integrated with our existing software stack, including a network driver and kernel bypass sockets library, allowing customers to progressively offload software functionality onto the FPGA. Building the example application is as simple as typing make, and the firmware image produced by the build process can be flashed to the card using our firmware update software utility. In addition, a full bus functional model is included with the development kit for design simulation and verification. All Ethernet Ports, DMA engines, user register space and user memory space. Makefile and build scripts included. Full bus functional model allows simulation of all interfaces. Latency figures available under NDA.